Based on the Pennsylvania Dutch hex signs. These colorful decorations have a wonderful history and are filled with symbolism. 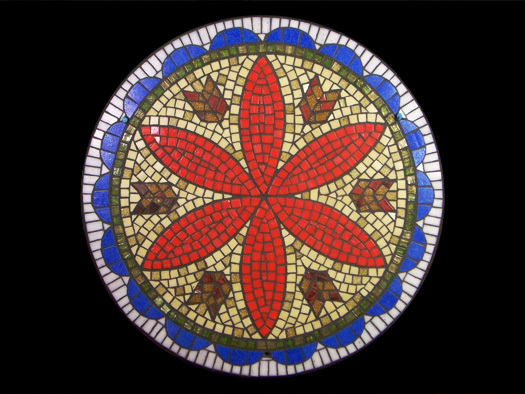 The single rosette is the most basic motif of hex signs and appears in many ancient designs in western culture. Its traditional meaning is of good luck, here reinforced by the scalloped border to symbolize smooth sailing through life. The stylized wheat stands for abundance and goodwill. The green ring is for growth and success, the red color for strength, blue for calmness, white for purity and yellow for health in body and mind.